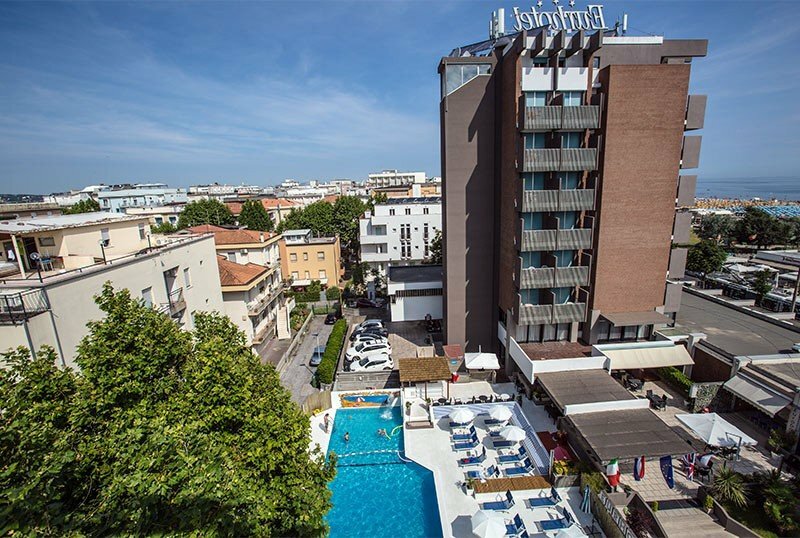 The Eurhotel , 3 stars superior of Miramare, has a large heated swimming pool, parking and sea view rooms. Open all year round and located a few steps from the beach, it offers many services dedicated to families and fun. The hotel admits small and medium-sized pets. The hotel is located near the Miramare beach, a hamlet just south of Rimini. Rimini's thermal baths are reachable on foot in about 15 minutes. The area is well connected by public transport: the historic center of Rimini, as well as Riccione, are easily reachable by bus line n. 11. The hotel has rooms with balcony with front or side sea view, independent air conditioning, WI-FI connection, satellite TV and digital terrestrial, telephone, safe, minibar, bathroom with shower, hairdryer and complimentary toiletries. Breakfast service in the room. FAMILIES : communicating solutions are available. Heated swimming pool, equipped terrace, reading room, congress hall, newspapers, beach towel in use, elevator. For an extra charge: shuttle service, laundry. Entertainment evenings and welcome drinks. PARKING : uncovered, available (subject to availability), free. Paid garage, by reservation. WI-FI : free throughout the entire structure. AIR CONDITIONING : free in the whole structure. CONVENTIONS : beach, amusement parks, spas, nightclubs, organized excursions, internal shuttle service for a fee, car hire, law enforcement conventions. DOMESTIC ANIMALS : admits small and medium-sized animals. Paid animal kit. BREAKFAST : sweet and savory buffet, hot drinks, homemade desserts. LUNCH AND DINNER : menu with 3 or more choices, buffet of appetizers and seasonal vegetables, water and wine included. VARIATIONS : vegetarian, vegan and celiac (both on request). OTHER : every week two themed dinners with tastings of typical products and live music; Sunday aperitif in the pool. In hotel: indoor and outdoor playground area, strollers, bicycle seats, pediatrician. At meals: baby menu, baby food, bottle warmer, seats at the table, afternoon snack. On the beach: playground and entertainment. The structure has a heated outdoor swimming pool, equipped with a trampoline, waterfall, WI-FI area, adjacent solarium area equipped with sunbeds and beach umbrella. 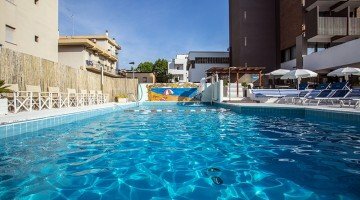 The hotel has an agreement with the bathing establishment 134 - Bagno Vittorio with: beach volleyball court, beach tennis, table tennis, free WI-FI area, pets allowed, entertainment for adults and children, playground for children, gym, fitness area and much more. For lovers of the sea and relaxation, we have designed an All Inclusive package to enjoy the first sun. - 1 week beach service with umbrella and sun bed.